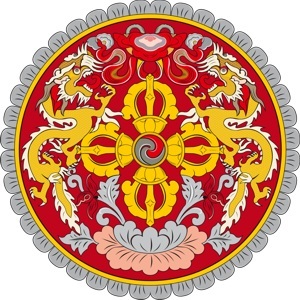 The Kingdom of Bhutan is a landlocked country in southern Asia. 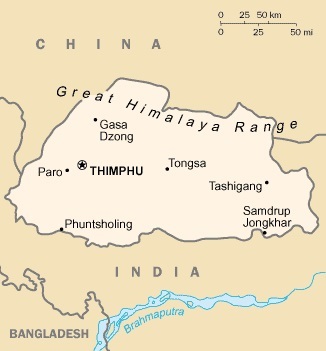 It lies at the extreme eastern end of the Himalaya Mountains and is bordered by India and the People's Republic of China. As of 2009, the population of Bhutan was estimated as being 691,141. The country's capital and largest city is Thimphu, which, as of 2005, had an estimated population of 98,676. An up-to-date, in-depth introduction to Bhutanese history, culture and ecology, with a comprehensive itinerary ranging from the major cities to the most remote monasteries. Special sections on selected topics, literary excerpts, and gorgeous photographs make this an essential guide to this remote, pristine mountain kingdom. Shoe-horned into the Grand Himalayas, Bhutan—Land of the Peaceful Thunder Dragon—is a fiercely independent kingdom that celebrated its centenary in 2008. Isolated, charming, peaceful, and religious, the Bhutanese are a pragmatic, sensitive people who take from the West what will benefit their country and leave the rest. The countryside is pristine, the lifestyle and culture have been preserved for centuries, and the love of life is abundant among the people. Few outsiders know Bhutan as intimately as Françoise Pommaret. In the West, we have everything we could possibly need or want—except for peace of mind. So writes Linda Leaming, a harried American who traveled from Nashville, Tennessee, to the rugged Himalayan nation of Bhutan—sometimes called the happiest place on Earth—to teach English and unlearn her politicized and polarized, energetic and impatient way of life. In Bhutan, if I have three things to do in a week, it’s considered busy. In the U.S., I have at least three things to do between breakfast and lunch. After losing her luggage immediately upon arrival, Leaming realized that she also had emotional baggage—a tendency toward inaction, a touch of self-absorption, and a hundred other trite, stupid, embarrassing, and inconsequential things—that needed to get lost as well. Pack up ideas and feelings that tie you down and send you lead-footed down the wrong path. Put them in a metaphorical suitcase and sling it over a metaphorical bridge in your mind. Let the river take them away. Forced by circumstance and her rustic surroundings to embrace a simplified life, Leaming made room for more useful beliefs. The thin air and hard climbs of her mountainous commute put her deeply in touch with her breath, helping her find focus and appreciation. The archaic, glacially paced bureaucracy of a Bhutanese bank taught her to go with the flow—and take up knitting. The ancient ritual of drinking tea brought tranquility, friendship, and, eventually, a husband. Each day, and each adventure, in her adopted home brought new insights and understandings to take back to frantic America, where she now practices the art of "simulating Bhutan." This collection of stories, impressions, and suggestions is a little nudge, a push, a leg up into the rarefied air of paradise—of bright sunlight and beautiful views. By Karma Choden & Culture Smart! The tiny Kingdom of Bhutan, at the eastern end of the Himalayas, nestles between the giant nation states of China and India. Often called the “Land of the Thunder Dragon,” it remained secluded until recent times—the first ever “tourist” set foot in Bhutan in 1974 and was followed by the introduction of television and new technology at the turn of the 21st century. In 2008, Bhutan became the world’s youngest democracy, moving from an absolute to a constitutional monarchy in a historic change initiated by the revered and much-loved Fourth King, Jigme Singye Wangchuck. A sovereign country throughout the ages, Bhutan is now establishing its place on the world stage and demonstrating leadership on climate and environmental issues. It is determined to maintain its Buddhist culture and way of life as it evolves and adapts to political change and economic challenges. Its unique development policy of “Gross National Happiness,” which measures progress not through material gain but on a happiness scale, is generating global interest. The abundant hospitality of the Bhutanese, the variety of Bhutan’s ancient monasteries and colorful festivals, and its near-perfect ecosystem and natural beauty never fail to reward the traveler. Culture Smart! Bhutan will give you a deeper insight into the country’s history, values, and customs, as well as practical guidance on how to develop a meaningful rapport with the Bhutanese. The extraordinary Himalayan kingdom of Bhutan is one of the world's most exciting new travel frontiers, a picture-book-beautiful mountain landscape with a rich Buddhist culture. The only country in the world to measure its success by the principals of Gross National Happiness, Bhutan is a truly unique place. Insight Pocket Guide Bhutan is a brand-new, full-colour travel guide that combines lively text with vivid photography to highlight the best that the country has to offer. Where To Go details all the key sights in the country, while handy maps on the cover flaps help you find your way around, and are cross-referenced to the text. Perfect Tour provides an itinerary of the country. What To Do is a snapshot of ways to spend your spare time, from mountain treks and visiting local festivals to shopping for traditional crafts and textiles. Essential information on Bhutan's culture, including a brief history of the country. 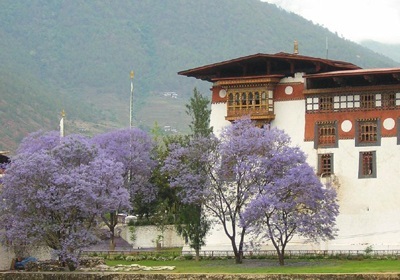 Lonely Planet Bhutan is your passport to all the most relevant and up-to-date advice on what to see, what to skip, and what hidden discoveries await you. Visit Tiger's Nest, Bhutan's most famous monastery, marvel at the dance routines of the tsechu festival, or trek through the mountainous regions of Bhutan; all with your trusted travel companion. Get to the heart of Bhutan and begin your journey now! Authors: Written and researched by Lonely Planet, Lindsay Brown and Bradley Mayhew.